BitBrum is a not for profit, community inspired, event. The sole aim of which is inform people about the technological, economic and societal impact of this nascent space. To equip people with the knowledge to avoid the scams & the tools and confidence to innovate. 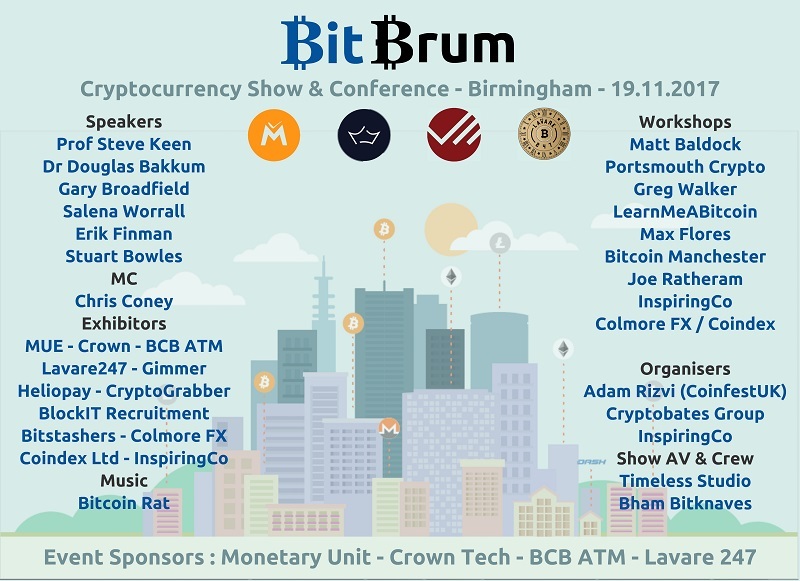 BitBrum 2017 was entirely free, featured world renown speakers, offered balanced and objective educational workshops and a was held in a pretty cool venue – right in the heart of Birmingham. BitBrum 2017 created a lot of interest. 200 tickets were taken and we catered for c250 people. We want to keep the event free to attend but that means we rely on entirely upon sponsors and exhibitors. Last year the event cost just over £10,000 and sponsorship & exhibitor income amounted to c50% of the costs. In rank order costs were; venue & catering (43%), design/print/media/web (22%), AV (10%), speaker/MC/educator T&A reimbursement, with the balance (5%) comprising event insurance, etc. The feedback from the principal sponsors & exhibitors (MUE, Crown, BCB-ATM, Lavare247, Gimmer, etc.) was that the event was a huge success and represented great value in terms of promotion. For exhibitors we aimed to keep the cost of participation as low as possible in order to encourage SMEs and start-ups to attend. A key point to note is that without the support of the highly regarded CoinfestUK organisers from Manchester who helped attract many of the sponsors then the event would not have happened.The same applies to all of the key speakers and educators who gave their time for free. Also many from the Birmingham Bitknaves Group who helped on the day and Timeless Studio who handled all the show AV and post editing at cost. To make BitBrum 2017 happen we relied on the hard work and generosity from people throughout the United Kingdom and many far beyond who believe in the community we share and are working for something that will benefit us all. Our region has a fine industrial & commercial heritage and together we thrive and prosper on diversity. But take a walk around the streets or travel around the region and you’ll see there are many problems to solve. We believe that cryptocurrencies (such as Bitcoin & ancillary ‘Blockchain’ technology) that offer; egalitarian friction-less commerce, decentralised security and permission-less innovation can be part of the solution. But we must work together, overcome the FUD and seize the opportunity they offer to all.